Anyhow – my Celestarium is keeping me quite entertained while I’m waiting. I’m done with the star charts and I’m now on the edging!! I decided to do a different edging than the one in the pattern. 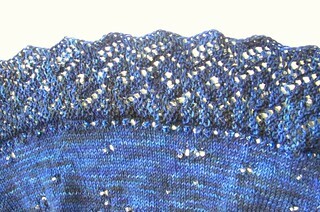 I added a row of eyelets with dark blue beads and then did an adaptation of an edging in Gossamer Webs. 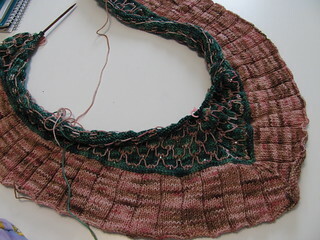 It’s still an applied edging (knit perpendicular to the shawl edge and ‘applied’ on to the edge as you go) which is making it seem to take forever, but it really is going fairly quickly. 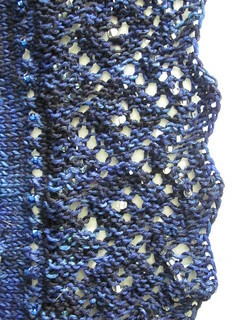 I am going to run out of yarn, though, so I went ahead and ordered another skein – hopefully it will get here soon because I think I’m going to run out in just the next day or two! I’m really happy with how this is turning out and I can not wait until I’m done and can block it!! I’m not enjoying this as well. 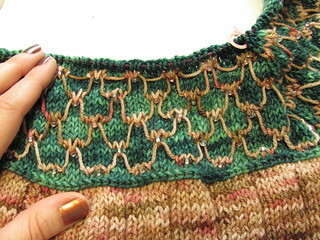 I’m not sure if it’s the fiddly slipped stitch rows that are making it less enjoyable, or if the Celestarium is just that much more of a draw that it’s making the Faberge seem like a chore. I do love the color combo, though. And the Bugga yarn is just so scrumptious. Well, that’s what I have this week. I hope to have a finished Celestarium to show you next week! (And a Master Knitter binder?) Go check out Tami’s Amis for more WiP Wednesday posts! Wow! Your Celestarium looks stunning! I love that you changed the edge, so pretty! Now I’m wondering if I can get another skein so I can do the same! 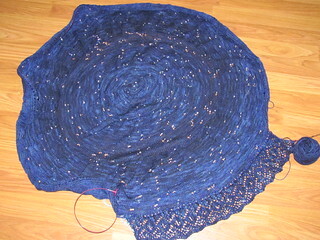 That shawl will be gorgeous, well, it already is! I like the edging you have chosen.